Pumpkins and childhood go together. It's partly Halloween jack o'lanterns, and partly beloved nursery rhymes such as "Peter Peter Pumpkin Eater." At least once during childhood, you really need to have a pumpkin patch and experience the thrill of growing these orange garden giants. n Their nickname is "the garden gorilla." They sprawl all over and can take over garden space that you mean for other plants. So it's a good idea to locate them on the edges of the garden, and as the vines grow, direct them toward the outside of the garden, away from your other garden plants. 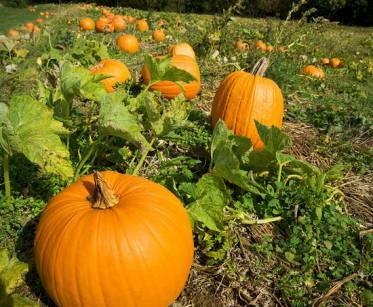 n If you have a small garden area, don't get seeds or plants that will yield large pumpkins that are 20 pounds or more. Go for jack o'lantern varieties that will stay under 10 pounds, or pie pumpkins that will end up about 5 pounds each, or mini's that are great for autumn decorating. n Pumpkins need 3 months of growing time, so start seeds indoors about 3 weeks before your last possible frost (Mother's Day in the Midwest), or set out transplants as soon as the soil temperature is about 70 degrees, usually around mid- to late May. 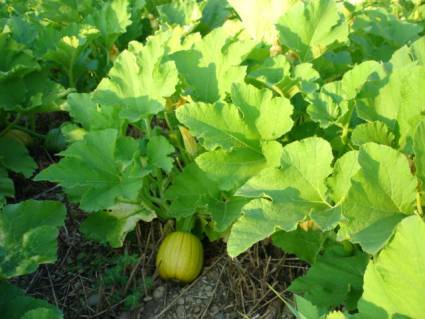 n Pumpkins will grow best in full sun; they take a lot of energy from the sun to grow so big. But as long as they get six hours of sun a day, they'll probably do fine. At first, baby pumpkins don't look like much . . . but just wait! n Before you plant, loosen an area in the soil as deep and as wide as a bushel basket, so that the roots have a really easy time of growing in that loose soil. You can add lots of compost, rotted manure, or seaweed. n Plant seeds or seedlings about as far apart as the seed packet or plant label suggest - three to five feet apart is typical. If you can afford it, lay down black plastic everywhere but about one square foot, where the plant will go, so that the rain and your watering can get to the roots. Secure the plastic with garden staples. That will keep the soil warmed up and the weeds down. n If you're planting seeds, you can make a "hill" of compost and place three seeds in it; after the plants are up, decide which is the best-looking grower, and cut off the other two plants at the soil level. That will protect you in case not all your seeds germinate. n Pumpkins like it hot; you'll notice their best growth spurts on days when it's about 90 degrees. n Pumpkins need a lot of water, and they need it to come evenly. They don't really like "wet feet" - soggy soil. So make sure the soil drains well where they are going, and make up a watering schedule. If you have a big rain or a couple of weeks of drought, adjust your watering accordingly so that the amount is about the same each week. n Make a "bed" of clean straw, sand, or a sheet of plywood, to put under each pumpkin to protect it from insects and moisture. n Feed with manure tea (soak a bag of rotted manure in a clean drywall bucket of water, and then remove the bag and voila - manure tea! Use it to fertilize garden plants) or other liquid fertilizer (Miracle Gro) every 10 days. n When the runners are 20 feet long, start pinching off new growth. That will force the energy into the pumpkins instead of longer vines. n Don't plant pumpkins near potatoes; they don't get along, botanically-speaking. n Watch out for squash bugs at the nymph and adult stages. You might make up a solution of water and a tablespoon of dish soap to spray the bugs, or just squash them with your hand. 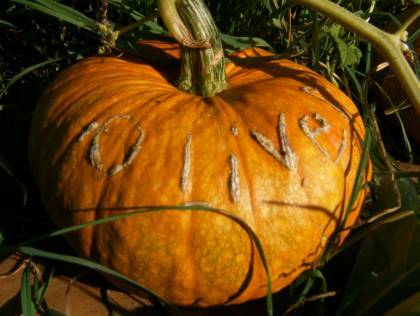 If you don't, your pumpkins may have pock marks from the hungry little critters. n A really fun thing to do as a surprise for children is to scratch his or her name into a pumpkin while the pumpkin is still small and the skin is soft. The pumpkin won't be harmed, and the name will grow along with the pumpkin. n Wait as long as you can, into October, to harvest your pumpkins so that they'll be fully ripe and in perfect shape for Halloween and autumn décor. n The stems should begin to shrivel and dry, and the skin should be so hard that you can barely cut it with your thumbnail. n Veteran gardeners wait 'til the evening before the first predicted frost of the fall. There shouldn't be frost on the pumpkins, despite the old saying, because that reduces their storage capability over the winter. n Leave at least an inch of vine on each one, and never pick up or carry by the handles; if the stem breaks off, the pumpkin won't last as long. n It's best to "cure" your pumpkins, or leave them outside in the sun, for 10 days. That helps harden their skins. If frost is predicted, cover them with old sheets or a tarpaulin.